For many, the word “exercise” conjures up hundreds of negative, SWEATY connotations. If you’re an introvert, you could likely multiply that number by a million. And if you’re me, one could amp it up even more. Exercise just sounds awful–exertion, perspiration, racing heart, muscle burn, etc. Combine that with the thought of joining a gym or signing up for a class with a bunch of strangers and the idea becomes absolutely overwhelming. So obviously, I’m not a fan…and yet, I’m also not an idiot. Exercise is important, that’s what THEY tell us anyway. They’re right, but that doesn’t mean we have to like it…or at least I don’t. As an introvert, exercise has been rather tricky for me. Fortunately, I’ve settled into a routine that hasn’t killed me (at least not yet!) and of course, I had to add my own dramatic flair to it. I mean it wouldn’t be me if I didn’t. 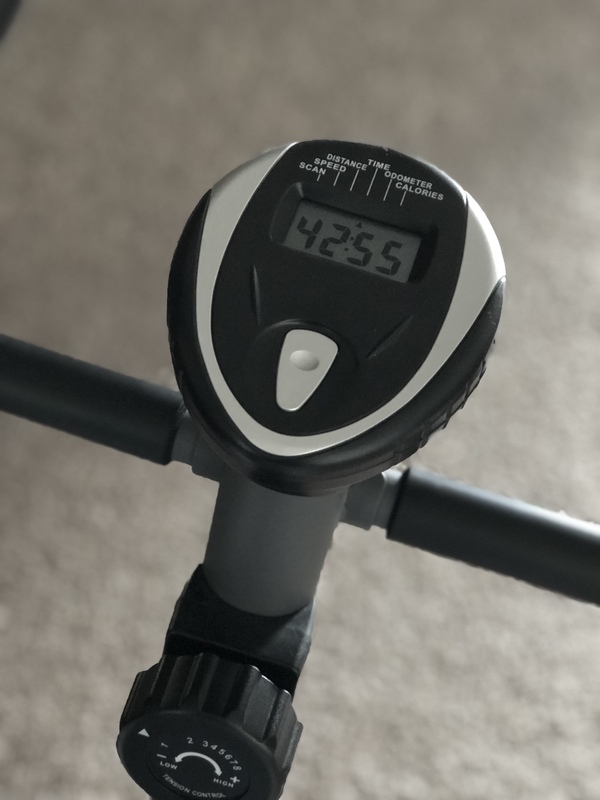 ENTER THE EXERCISE BIKE. You’ve probably seen the Peleton commercials and I’m definitely not that girl, but it was my inspiration. I figured a stationary bike was perfect for me. I could ride at my own pace, work up to a good solid routine, stay indoors, and monitor my progress all while indulging in Netflix! Jealous, right? It was the perfect solution…ALMOST. It wasn’t long before I decided that this was a little too easy. I mean the saying goes, “no pain, no gain,” right? So I decided I needed to add an element of suffering AND discomfort to my cycling. Thus, the Country CARDIO music playlist was born. 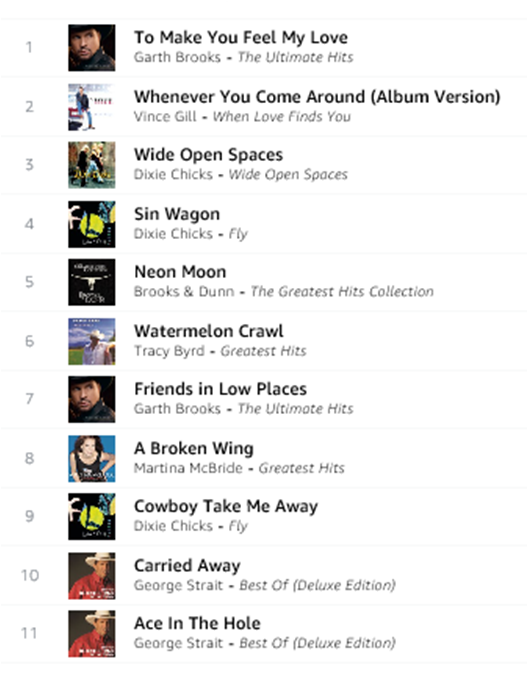 These 11 country songs fuel my 10-mile daily ride all the while generating an emotional punch that stirs up just the right amount of heartbreak, memories (good and bad,) and tearfulness. From the very first song to the last song, I experience a rollercoaster of feelings…love found, love lost, break-ups, good times, hopefulness, hopelessness, dreams shattered, dreams fulfilled and more. Yes, all good stuff! And while I only truly loved country music for a few years in the 1990s, these songs are near and dear to my heart today. I can remember exactly where I was, who I was with, and all the circumstances surrounding each song. It’s like unlocking a memory treasure chest with each pedal turn…the perfect compliment to my current midlife crisis. All the nostalgia of George Strait and Garth Brooks combined with girl power ballads from Martina McBride and The Dixie Chicks (yes, I’ve forgiven them,) intertwined with Tracy Byrd, Vince Gill, and Brooks & Dunn. (Betcha can’t guess which song is my favorite?) The memories span from leaving home for college to moving halfway across the country AND BACK, plus so many more. One minute I’m so grateful for everything, then a simple song change has me feeling all melancholy in a lonesome bar somewhere. Another song has me completely heartbroken and the next musical selection reminds me how much I learned from that same heartache. To quote one favorite, “And the words of every sad song seem to say what I think….” Sure, it’s a tad dramatic, but that’s what makes it perfect. It’s not that I don’t need sleep. Trust me, I NEED it! It’s just that my clock is “off.” I could try blaming age, but my real trouble with sleep began way before that. It seems that at bedtime…I’m just not tired. As a child I remember sharing a room with my little sister and after lights out, we would simply stay up and talk…or sing. (We had these singing contests where we tried to win the other person over to our song. Popular catchy songs work well, but if I remember right, annoying brain worm songs like “Mary Had a Little Lamb” worked much better!) I also loved to tell stories and like an old woman I could spin a yarn that would go on for days. My poor sister! On more than one occasion I’d tell a story that would go on so long that she would fall asleep before it ended 🙂 It was slightly embarrassing…. Only slightly. In junior high and especially high school, I continued my night owl ways. It wasn’t that I wasn’t tired. I really, really was! But afterschool activities, a social life and school work kept me up ’til the wee hours of the morning. (Before you jump to any conclusions let it be known that I stayed up way later for school work than for anything else! I know–I’m a NERD 🙂 ) For some reason, I always felt like I had more energy at night. 11pm seems to be peak time for me. To be fair, I have to admit that I am not a morning person. Not at all. Maybe that’s part of why I’m a night owl. During my college years, being a night owl just went with the territory. We were all night owls…burning the candle at both ends. It wasn’t that big of a deal–nothing ever is at that age. Wake up early, stay up late…some nights sleep was more of a good idea than a reality. I can remember going to a Poe concert the night before a final, closing down the club, going out to breakfast, drinking my weight in coffee, studying for an hour and arriving on campus just in time to take a 7am final–and acing it. (Good genetics, I can thank my Mom for my test taking abilities!) This was the way life rolled and I loved it! Yes, sleep was overrated indeed. We are so invincible in our 20s…. One might think that motherhood would change everything. No. Now I had an excuse to be awake at all hours of the night. Pregnancy, middle of the night feedings, a colicky baby, illness of one kind or another, bad dreams, etc. All this and so much more just pushed my night owl tendencies to the next level because a sleeping child meant that I could have a moment to do what I wanted to do. You know, like watch a sitcom from beginning to end (forget movies…that’s asking for too much time,) have a snack and not have to share, catch up on correspondence, READ, and have a continuous thought (crazy, right?) Let me be clear, my late night tendencies have never had anything to do with insomnia (which sounds horrible!) It really is LIGHTS OUT once my head hits the pillow. It’s just that I can find a million and one things to do before going to sleep. Did I mention that I drink ALOT of coffee? My best friend recently told me that she has successfully made “the transition,” moving from night owl (she was my social counterpart in my early years) to morning person. I know–it just doesn’t seem possible! No longer does she fritter away the late night hours or need to set several alarm clocks to wake up in the morning. Instead she’s up with the sun and happy about it. So what’s her secret? She tells me that through prayer and discipline she has made a change for the better. Wouldn’t you just know it? Jesus is the answer (again!) I have to tell you that I’m not optimistic. It’s not that I don’t have faith…it’s more that I don’t know if I’m ready. Because you see EVERY part of me LIKES staying up late. It’s my chance to breathe, to sit without interruption, to find peace, READ and have a continuous thought all my own! (Notice a theme here?) I like being the only person awake in the quiet of our little home. Maybe it’s an introvert thing, but nighttime is MY TIME! 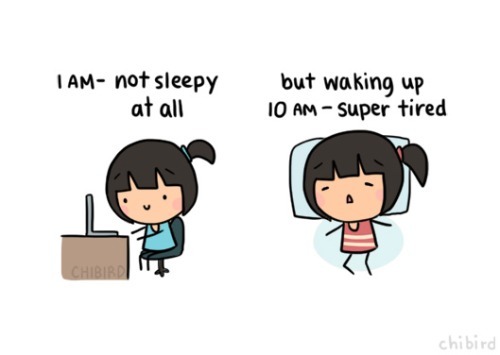 Okay, so someday (soon) I plan to grow up and get serious about sleep and taking care of myself. And when I do, I know (without a doubt) that Jesus will see me through. That and the threat of WRINKLES….